Balsamic Blueberry & Maple - Miam! Made with whole blueberries steeped in our own blend of spices and Balsamic, our Balsamic Blueberry Maple Vinegar displays a deep and rich blueberry flavor enhanced with the sweetness of pure Vermont maple syrup. 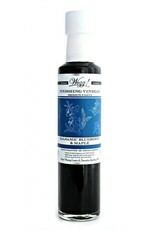 A great summer salad dressing and a sweet and tangy finishing sauce perfect for chicken, pork, turkey, duck and venison. Reduce on the stove top to make a sweet fruity balsamic drizzle for meat, salad and fresh fruit. Discontinued product. Was $13.95. Best before end of September 2019.